You can use Windows ReadyBoost technology to improve hard drive performance. 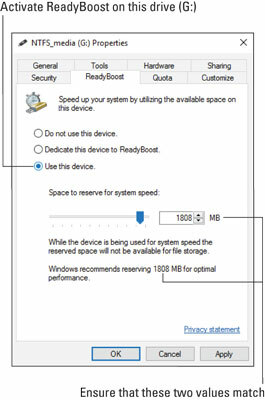 ReadyBoost works by supplementing system memory and mass storage access with a portion of fast flash memory from a USB thumb drive. To make ReadyBoost work, you need a thumb drive or media card with a capacity between 256MB and 32GB. Further, you should use a USB 3.0 thumb drive and attach it to a USB 3.0 port on the back of your PC. It’s best to use the back because this thumb drive is dedicated to ReadyBoost; you won’t use it for anything else. Plug the thumb drive into a USB port on your PC. You may see an AutoPlay notification appear. Dismiss the notification, though if you see a ReadyBoost option, choose it as a shortcut. Press Win+E to open a File Explorer window. Choose This PC from the items listed on the left side of the window. You see an overview of all storage available to your computer. One of the items listed is the thumb drive you just inserted. Right‐click on the thumb drive’s icon in the This PC window. In the drive’s Properties dialog box, click the ReadyBoost tab. If you don’t see the ReadyBoost tab, the thumb drive’s technology isn’t compatible with ReadyBoost. Otherwise, you see settings similar to the ones shown. Choose the option Use This Device. Other settings presented need no further modification. ReadyBoost is ready to boost. Your PC immediately starts using the thumb drive to improve performance. Don’t be alarmed if its Capacity graphic in the This PC window turns red. That’s the setup you want; nearly all the thumb drive’s storage is used to improve PC performance. For another performance boost, consider adding a second thumb drive to your PC and dedicating it as well to ReadyBoost. You can use as many as eight thumb drives with ReadyBoost on a single PC.